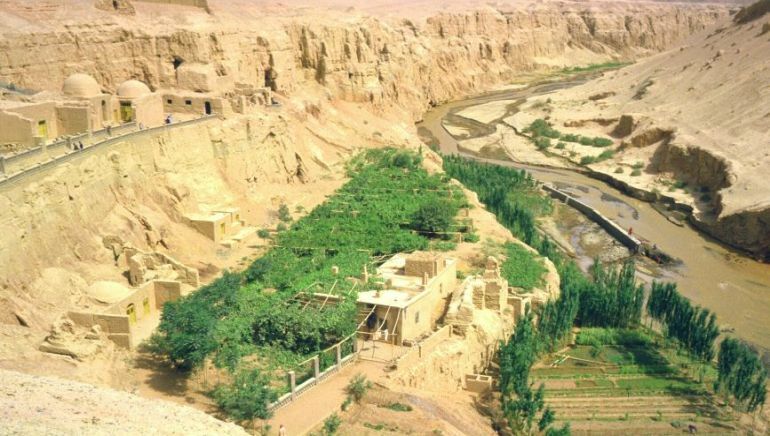 The Turpan Oasis. Source: International Caravan Travel Service. The Yanghai Tombs in the Turpan Basin (Xinjiang Autonomous Region) of northwest China account for extremes of factors. Located in the Gobi desert region of the country, these tombs mainly built by and for the nomadic pastoralists of the Subeixi culture, are arranged in a gargantuan cemetery that encompasses a whopping 600,000 sq ft of area – which is equivalent of more than ten American football fields. And beyond just the size, the tombs are home to many of history’s firsts, including what is probably the world’s oldest known stash of marijuana. According to a study published in 2008, in the Journal of Experimental Botany, researchers identified nearly two pounds of the ‘green’ plant material inside a 2,700-year-old grave from the Yanghai Tombs. And interestingly enough, the deceased occupant of the grave was found to be 45-year old Caucasian man, who probably hailed from the Indo-European Gushi people. Originally mistaken for coriander, the scientists (from the Chinese Academy of Sciences Institute of Botany) carried out microscopic analysis of the ‘verdant’ organic matter, which revealed its cannabis identity. And moreover, subsequent tests proved that this item, originally kept on a wooden bowl inside the grave, possessed potent psychoactive properties. In fact, the lead author of the study Ethan Russo explained how the matter could produce THC (tetrahydrocannabinolic acid synthase), which is basically the main psychoactive chemical in the plant. 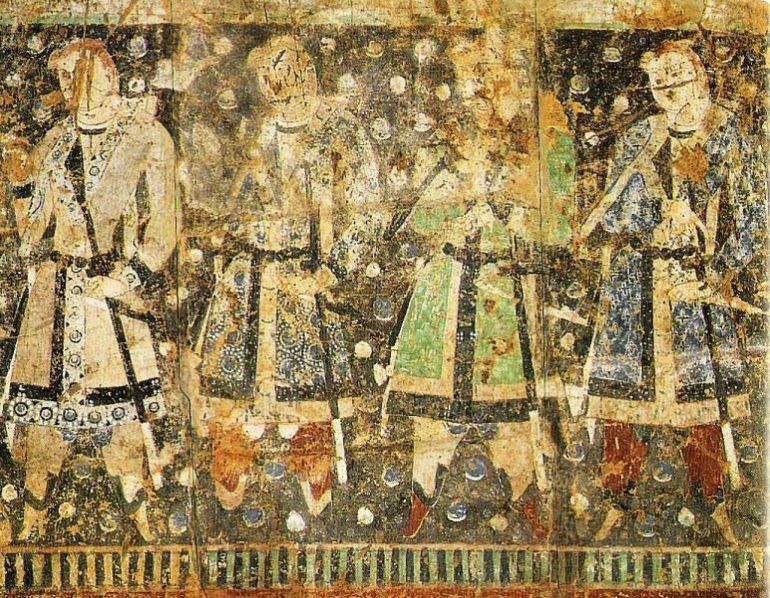 Depiction of Tocharian people inside a 6th century AD cave. The Gushi people were probably related to the Tocharians. Credit: WikiCommons. Now some history-based theories suggest how the ancients grew cannabis for the hemp that was apparently used for ‘innocuous’ activities like making clothing, ropes and other mundane items. However the aforementioned psychoactive property discovered in this instance also hints at the actual consumption of marijuana in the ancient times for what can be termed as recreational use. To that end, the researchers were able to discern the type of seeds mixed in with the ‘weed’ (along with the color and composition), and they came to the conclusion that this marijuana sample was sourced from a cultivated strain. Even more explicitly, before the burial, someone took the pain to remove all of the male plant parts, which are less psychoactive – thus alluding to the Gushi people’s penchant for ‘getting high’. Recent studies have actually established the unique scope of how cannabis was one of the widely traded items across the Eurasian landmass from almost 5,000 years ago. For example, according to a collaborative research (in 2016) from the German Archaeological Institute and the Free University of Berlin, there were ancient ‘pot dealers’ who mainly came from steppe nomadic group known as the Yamnaya. Hailing from what is modern-day Russia and Ukraine, these people brought forth a plethora of advancements to Europe, including metalworking, horseback riding and the application of wheels. And additionally they also packed their ‘luggage’ with cannabis, thus making them the first drug-dealers in history who controlled a nexus across the Eurasian continents. After the burial…they set up three poles leaning together to a point and cover them with woolen mat…They make a pit in the center beneath the poles and throw red-hot stones into it…they take the seed of the hemp and creeping under the mats they throw it on the red-hot stones, and being thrown, it smolders and sends forth so much steam that no Greek vapor-bath could surpass it. The Scythians howl in their joy at the vapor-bath. 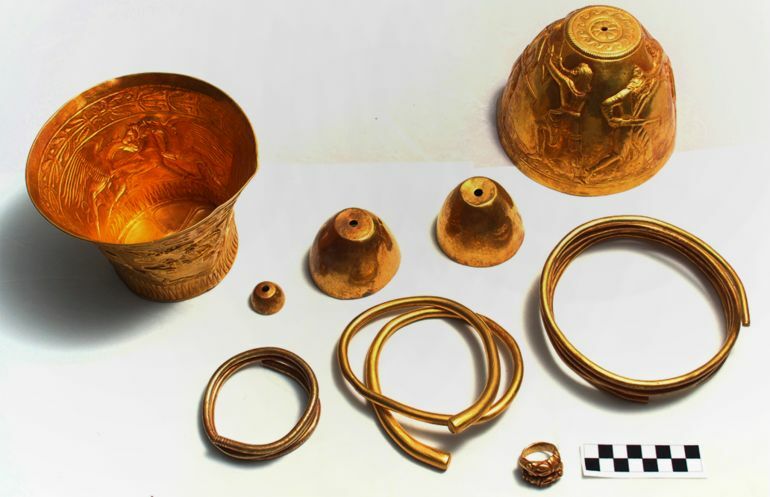 The archaeological evidence suggesting such recreational drug use scenarios were confirmed in 2015 by Russian researchers, who came across solid gold ‘bongs’ with exquisite craftsmanship (pictured above), inside a kurgan mound located in the Caucasus region. The experts additionally identified a black residue on the inner portion of one of the gold vessels. On further analysis of the substance (by criminologists), the results showed that the residues had been formed by not only cannabis, but also opium. In any case, coming back to the historical scope of the world’s oldest known stash of marijuana in the Yanghai Tombs, the scientists couldn’t locate any ‘instrument’ in the proximate area that would have aided in the inhaling of the marijuana smoke (as opposed to the Scythian burial mentioned in the earlier paragraph). This has led the experts to hypothesize that the marijuana was either ingested orally or fumigated – by the Gushi people. Furthermore, the Caucasian occupant of the grave itself may have been a high-ranking shaman of his clan, as could be theorized from his rare and valuable burial goods, ranging from a make-up bag, bridles, pots to archery equipment and even a harp. In that regard, the very ingestion of psychoactive matter might have pertained to a ritualistic angle in his highly-regarded occupation.